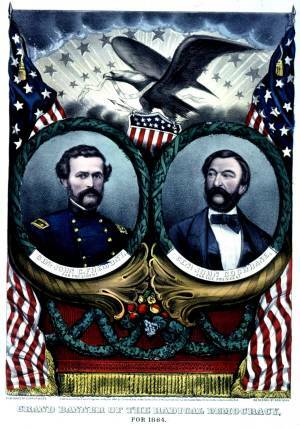 "Grand Banner of the Radical Democracy"
A campaign banner for presidential nominee John C. Frémont and his running-mate John Cochrane. Frémont and Cochrane were the nominees of a faction of radicals consisting mostly of Germans and abolitionists. The nominees’ bust portraits appear in the center in roundels framed with oak leaves, supported by two cornucopias (representing prosperity) and surmounted by the American Eagle holding the American shield. The eagle appears against a field of stars and rays of light that stream from behind a dark cloud. Flanking the composition are two American flags.